Here’s an interesting thought. While reading Volkswagen’s current sales reporting, an interesting and continuing trend leaped out. Quite simply, it was this: VW’s continuing sales success has a lot to do with its success in SUVs and crossovers. Indeed, you can say that if it wasn’t for the 2018 Atlas and the 2018 Tiguan, VW might not enjoy the sales success it is enjoying. For example, VW has reported April sales of 28,794 units, a 4.5 percent increase over April 2017. Through April, VW has delivered 112,746 units, an 8.6 percent increase in year-over-year sales, the best since 2014. The Atlas and the 2018 Tiguan, a three-row crossover, are leading the automaker’s sales success as they make up 45 percent of the monthly volume. Interestingly, the diesel emissions scandal had more than a bit to do with VW’s current sales success. The scandal gave the VW Dealer Council a larger voice in the company’s decisions about the then-upcoming Atlas. At that time, Wolfsburg set the marketing plans for any vehicle the automaker was to build. They also set the name and determined where vehicles would be built. The scandal turned things over. It gave U.S. dealers clout they had not had before. The dealers wanted control of the Atlas’ naming and marketing, two issues that VW was adamant about. The emissions scandal gave the Dealer Council enough extra push to wrest these critical items away from Wolfsburg. So, when it came time to name the new three-row SUV, the dealers were able to put the very American name Atlas on the new SUV. The marketing effort was also distinctly American in flavor, which it is (look at the family running away from the Atlas as a herd of bees chases them around; it’s not something you would coming from VW’s German offices. Instead, it would be more techno than anything else). Since its launch at the beginning of last summer, the Atlas has been a constant success. And, when VW decided to stretch the Tiguan. VW took what was a slow-mover, but which also had potential, and turned it into another strong seller. 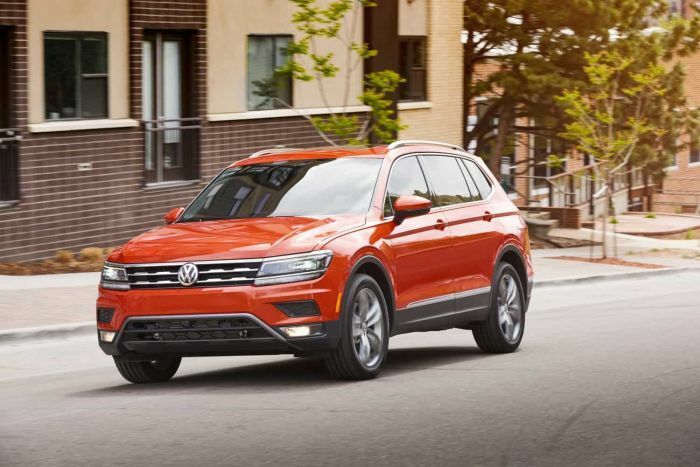 Apparently, VW was impressed by the early customer clinics that were held with potential customers and the automaker leading the automaker to the conclusion that stretching the Tiguan would be an excellent idea. Using the very flexible MQB platform – the platform that underlies every current VW from the Golf to the new Passat and Arteon, as well as the Atlas – VW stretched the Tiguan about 10 inches in wheelbase and nearly 20 inches overall. The automaker found that when customers viewed the stretched compact three-row crossover they liked it. That’s what sales have shown, too. Since it was introduced officially nearly a year ago, the Tiguan has moved to the front of VW’s sales reports and has remained there. As noted, the long Tiguan and the Atlas made up nearly 50 percent of VW’s sales for the month. In fact, since they went on sale nearly a year ago, the pair have increased their share of the sales mix. Indeed, this is one of the goals Volkswagen management set. Perhaps the key to Volkswagen’s SUV/crossover-driven marketing campaign was VW’s desire to get to the highly profitable and hotly contested midsized SUV/compact crossover segment. The Atlas and 2018 Tiguan have done just that. They have been able to compete quite well against the likes of the Honda CR-V, Toyota RAV4, Toyota Highlander, Honda Pilot, as well as BMW’s and Mercedes-Benz’ various models. Few would have thought it possible. Derrick Hatami, VW’s executive veep of sales and marketing, was cautiously optimistic in describing sales performance so far. He noted the automaker is “encouraged with the brand’s continued growth in the market, driving by the success of” Atlas and the 2018 Tiguan.. “We are also excited to have the all-new 2019 Jetta going on sale later this month, adding to the positive momentum. Based on the same flexible platform used in its other new models, the 2019 Jetta is expected to arrive at dealerships later this month. Jetta is one of the world’s most successful sedans. More than 17 million have been sold worldwide in the 35 years it has been on sale. Of that number, mlore than 3.2 million have been sold in the U.S. VW is probably hopeful that Jetta can maintain respectable sales numbers in the face of a sedan market which has been tailing away for the entire auto industry. Buyer preference beginning the middle of 2016 has been for crossovers and SUVs and the industry has responded. Demand for crossovers and SUVs has surpassed the former market leader, the midsized sedan. Every automaker has felt this market change. That is not to say that specific market segments haven’t held on reasonably in the face of this competition. For example, the Golf family has held onto or expanded its grip a bit. Models such as the GTI and Golf R have been surprising in their tenacity and popularity. Even models such as the Beetle Cabrio have also been somewhat surprising, as well. On the other hand, the redone Passat has been disappointing as its sales have lagged, even after more than a billion in investment. One factor that has helped encourage buyers to try the Volkswagen brand is its “People First Warranty.” VW's longer warranty explained.Modeled on other brands whose warranties are more than 3/36 – the industry standard for years – VW is offering a six-year/72,000-mile bumper-to-bumper new vehicle limited warranty. The lengthened warranty is a sales tool, as well, as it can be transferred to subsequent owners during the duration. BMW’s warranty also works like this.